I once made these at a dinner party and they unexpectedly were the best dish of the entire meal!! These skewers are perfect for summertime grilling (especially for vegans and vegetarians), served on top of a salad or just as a side. Directions: To make cherry tomato skewers, in a large bowl whisk together the oil, vinegar, minced garlic and thyme in a medium bowl. Add the tomatoes and toss to coat. Let tomatoes sit at room temperature for 30 minutes to marinate. Heat the grill (or a grill pan) to high. 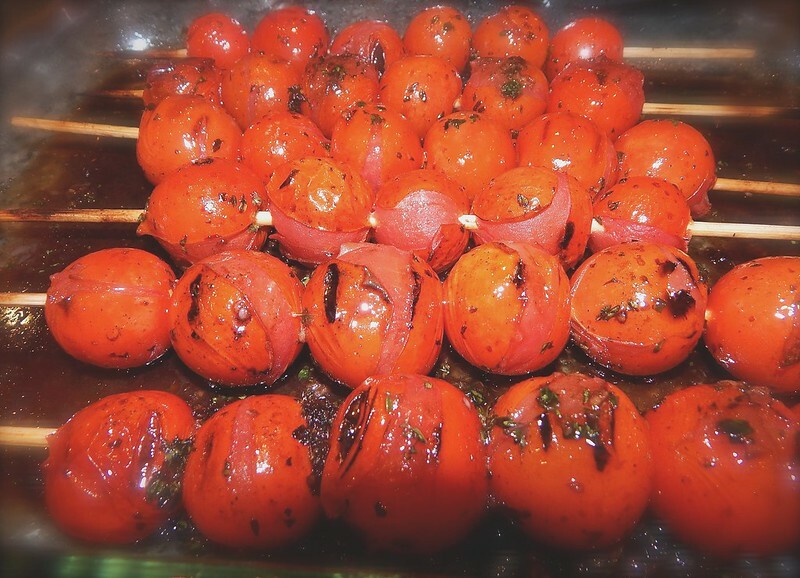 Remove the tomatoes from the marinade and skewer 6 cherry tomatoes per skewer. Season on both sides with salt and pepper and grill until golden brown and slightly charred on both sides, about 6 minutes (depending on how hot your barbecue is). Serve!